UK first release of US Jazzland label JLP19. Hand etched matrix not any of the UK majors, who all had drilled or stamped matrix codes. It actually looks similar to some US Riverside etchings I have seen, possibly US metal was shipped over for pressing but the 1L 2L suffix is I think a Philips numbering of sides system. Sole bidder, inexpensive, nice happy Riverside with some great playing. Business taken care of. 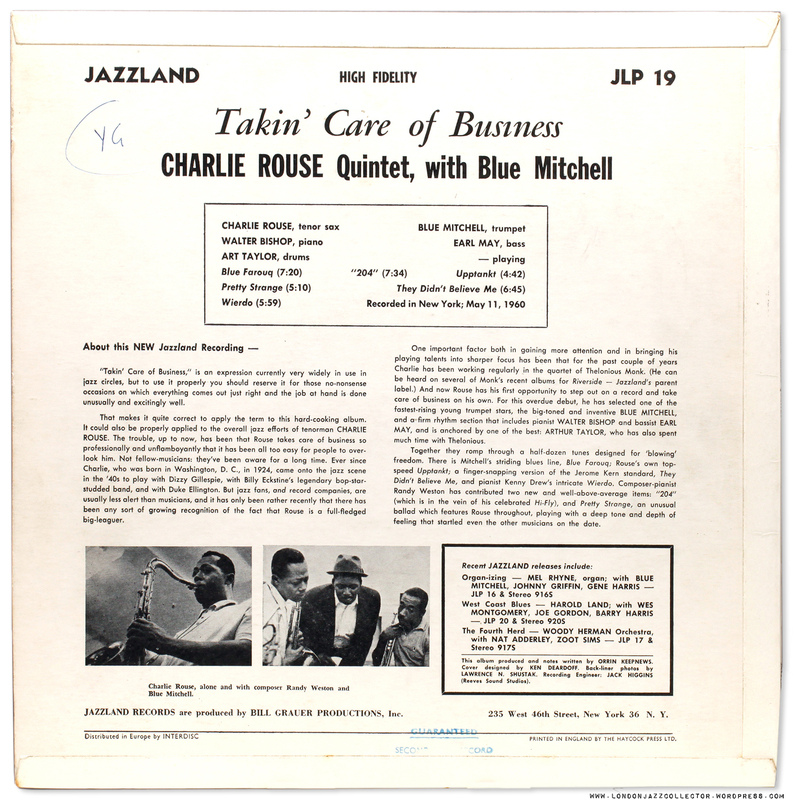 This entry was posted in Blue Mitchell, Charlie Rouse, Riverside and tagged Art Taylor, Blue Mitchell, Charlie Rouse, Earl May, Jazzland, Riverside, Walter Bishop Jr. by LondonJazzCollector. Bookmark the permalink. 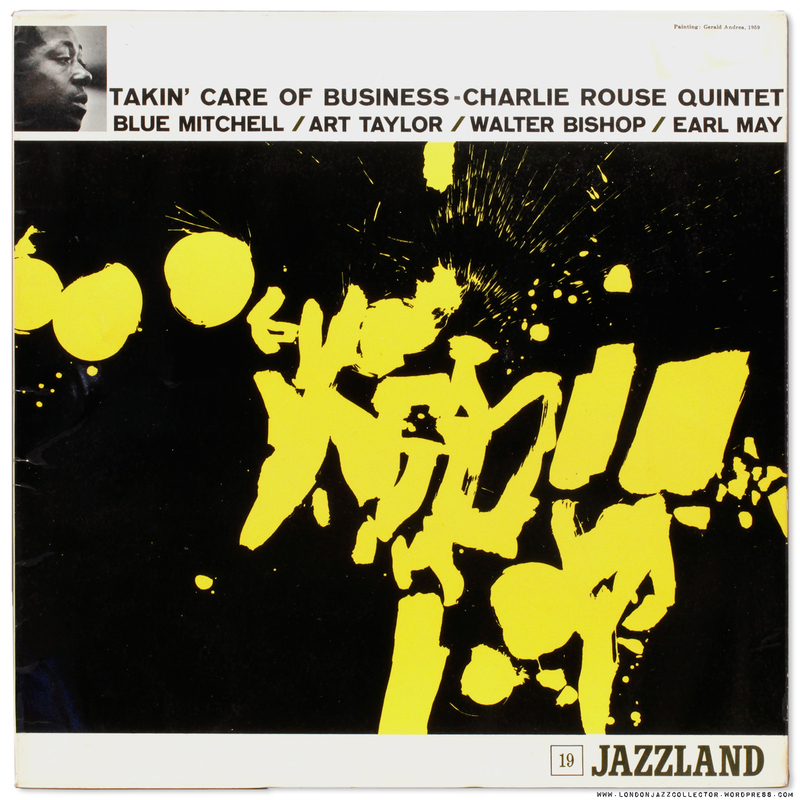 I have a slightly later LP from 1983 that features Mr Rouse alongside Kenny Barron, Ben Riley and Buster Williams. “Flight Path” by Sphere on the Elektra Musician label. It’s another that can be picked up for less than a tenner that has RVG etched into the runout. Dear fellow collectors, I have a question to those who know something more about Jazzland pressings. I thought, that original pressings were white for Promos, orange for mono and black for stereo pressings. After Jazzland belonged to Orpheum, the labels were maroon. Can anyone shed light on orange Bill Grauer pressings, that are stereophonic and no DG despite having a low catalogue number? From what period are they? There is a black non-DG Stereo Riverside (RLP 9 366) there. Thank you for the reply. I don’t know it without checking back, but somewhere in the higher area they stopped pressing the DG, so later issues without DG were original first pressings. I wish I’d get good quality pictures so that I could help you out with white and black DG labels. Meanwhile, there’s still the tricky orange label without DG and a Stereophonic addition without being an Orpheum pressing. I’d like to know as well. Perhaps something for the board? I didn’t make myself clear, sorry for that. It was not a technical issue, I just had no speakers at the PC. I just counted on the fact that UK pressings almost always sound very nice. For me it’s just a personal thing. I’d like to have the original issue of a record, for a couple of reasons – most of them being philosophical. My philosophy, of course. One hard fact is, that I simply don’t like the flipback-covers, even if they are much stronger. Otherwise I still cannot understand, why they released such records with blue Riverside labels. Yes, Jazzland belonged to Riverside, but it wasn’t released on Riverside, actually. I don’t like things being messed up, I guess. But honestly, I definitely would pick up an inexpensive copy as well (until an original comes along). And comin’ back to the UK for Crate Diggin’ would be great. That’s one of my favorite cover-designs. Wonderful enough to hang it on a wall. The music is enjoyable as well but it never really starts cooking, I’d say. I’m still looking for a inexpensive original orange label pressings. 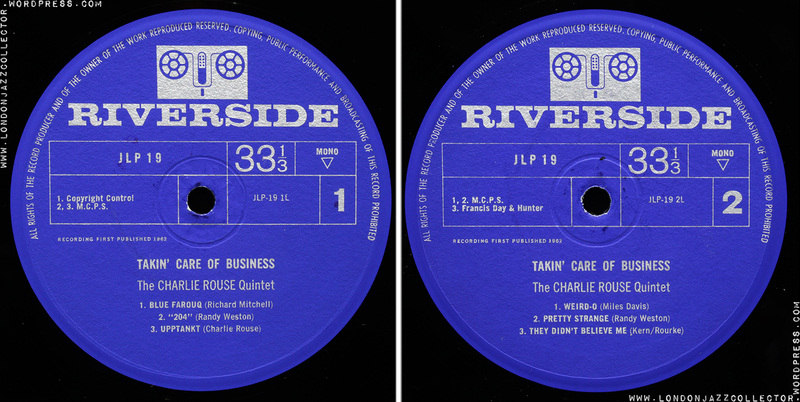 I’m still not satisfied with these european blue label Riverside/Jazzland pressings. Couldn’t listen to the soundfile, but I guess the sound is pretty decent? No sound? Ipad? It doesn’t support Flash required by the browser streaming add-in. Price to be paid for trying to look cool. This is a nice clear rich pressing.